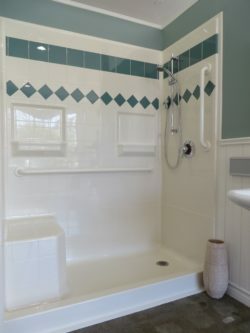 Need to convert a bathtub into a walk-in shower in a hurry? Or perhaps you want the convenience of receiving everything you need all at once, in one handy shipment? If so, ORCA HealthCare’s range of Speed-It-Up Walk-In Showers is perfect for you. With shower valve with glide bar and handheld shower head, grab bars, a fold-up shower seat, curtain rods and brackets, a vinyl shower curtain, and WaterStopper water dam all included, you’ll be able to get on with the installation process as soon as your pack arrives. Designed especially for those who urgently need to complete an accessible bathroom project, our Speed-It-Up Walk-In Shower packs contain all the essentials to install a safe, durable and attractive walk-in shower. ORCA HealthCare offers free shipping as standard, and because we understand that sometimes you need to complete a project at short notice, we ship our Speed-It-Up packages within 24 hours of receiving your order. We have packages to suit a range of requirements so it’s easy to find the perfect fit for your project. 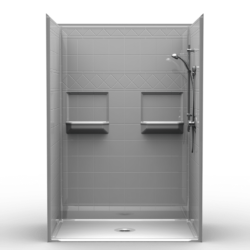 We offer our Speed-It-Up Walk-In Showers in 20 different sizes, so you can be confident of completing your retrofit in no time. Pre-leveled shower pans are included, so there’s no need for mud setting, while the beautiful yet tough gelcoat offers easy cleaning and an attractive finish your client is sure to love. Sturdy, plywood backing allows accessories to be fitted straight onto the walls, minimizing the time needed for installation, while the innovative snap-joint clip construction offers added convenience and durability. A selection of our handy, easy step showers are ADA compliant too, making them suitable for installation in commercial settings. These packages also come complete with pre-installed shower accessories, saving you even more time and effort. Showers shipped Super Fast when you are in a hurry !! If you’re new to ORCA HealthCare, check out this video to see just how easy it is to install our walk-in showers. 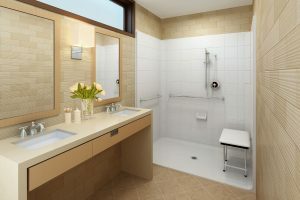 As an experienced walk-in shower company, we work with clients on a range of projects of all sizes and pride ourselves on offering unparalleled service and only the highest quality products.